Abstract: This paper considers the relevance of the concept of “eugenics,”—a term associated with some of the most egregious crimes of the twentieth century—to the possibility of editing human genomes. The author identifies some uses of gene editing as eugenics but proposes that this identification does not suffice to condemn them. He proposes that we should distinguish between “morally wrong” practices, which should be condemned, and “morally problematic” practices that call for solutions, and he suggests that eugenic uses of gene editing fall into this latter category. Although when we choose the characteristics of future people we are engaging in morally dangerous acts, some interventions in human heredity should nevertheless be acknowledged as morally good. These morally good eugenic interventions include some uses of preimplantation genetic diagnosis. The author argues that we should think about eugenic interventions in the same way that we think about morally problematic interventions in public health. When we recognize some uses of gene editing as eugenics, we make the dangers of selecting or modifying human genetic material explicit. Abstract: Gene editors such as CRISPR could be used to create stronger, faster, or more resilient nonhuman animals. This is of keen interest to people who breed, train, race, and profit off the millions of animals used in sport that contribute billions of dollars to legal and illegal economies across the globe. People have tried for millennia to perfect sport animals; CRISPR proposes to do in one generation what might have taken decades previously. Moreover, gene editing may facilitate enhancing animals’ capacities beyond their typical limits. This paper describes the state of animal use and engineering for sport, examines the moral status of animals, and analyzes current and future ethical issues at the intersection of animal use, gene editing, and sports. We argue that animal sport enthusiasts and animal welfarists alike should be concerned about the inevitable use of CRISPR in sport animals. Though in principle CRISPR could be used to improve sport animals’ well-being, we think it is unlikely in practice to do so. Abstract: During the previous years, voluntary moral bioenhancement (VMBE) has been contrasted to compulsory moral bioenhancement (CMBE). In this paper a third possible type of moral bioenhancement is discussed: genome editing for moral enhancement of the unborn that is neither voluntary nor compulsory, but involuntary. Involuntary moral bioenhancement (IMBE) might engineer people who will be more moral than they otherwise would have been. The possibilities of genome editing aimed at moral enhancement of our offspring is assessed. It is argued that genome editing might have the potential to engineer our offspring in three domains: to be more empathetic, to be less violently aggressive, and to have a higher potential for complex moral reflection. Genome editing is discussed in these three domains, and a proposal made that a combination of VMBE and IMBE might be the best option humans have to become better. Abstract: The advent of CRISPR-Cas9 technology has increased attention, and contention, regarding the use and regulation of genome editing technologies. Public discussions continue to give evidence of this debate falling back into the previous polarized positions of technological enthusiasts versus those who are more cautious in their approach. One response to this contentious relapse could be to view this promising and problematic new technology from a radically different perspective that embraces both the excitement of this technological advance and the prudence necessary to use it well. The thought of Teilhard de Chardin provides this desired perspective, and some insights that may help carry forward public discussions to achieve widely accepted uses and regulations. Abstract: How should we regulate genome editing in the face of persistent substantive disagreement about the moral status of this technology and its applications' In this paper, we aim to contribute to resolving this question. We first present two diametrically opposed possible approaches to the regulation of genome editing. A first approach, which we refer to as “elitist,” is inspired by Joshua Greene’s work in moral psychology. It aims to derive at an abstract theoretical level what preferences people would have if they were committed to implementing public policies regulating genome editing in a context of ethical pluralism. The second approach, which we refer to as the democratic approach, defended by Francoise Baylis and Sheila Jasanoff et al., emphasizes the importance of including the public’s expressed attitudes in the regulation of genome editing. After pointing out a serious shortcoming with each of these approaches, we propose our own favored approach—the “enlightened democracy” approach—which attempts to combine the strengths of the elitist and democratic approaches while avoiding their weaknesses. Abstract: In recent years, CRISPR-Cas9 has become one of the simplest and most cost-effective genetic engineering techniques among scientists and researchers aiming to alter genes in organisms. As Zika came to the fore as a global health crisis, many suggested the use of CRISPR-Cas9 gene drives in mosquitoes as a possible means to prevent the transmission of the virus without the need to subject humans to risky experimental treatments. This paper suggests that using gene drives or other forms of genome editing in nonhumans (like mosquitos) for the purposes of disease prevention raises important issues about informed consent. Additionally, it examines the consequences this line of inquiry could have for the use of gene drives as a tool in public health and suggests that the guidance offered by informed consent protocols could help the scientific community deploy gene drives in a way that ensures that ongoing research is consistent with our ethical priorities. Abstract: This paper provides an analysis of the statement, made in many papers and reports on the use of gene editing in humans, that we should only use the technology when it is safe. It provides an analysis of what the statement means in the context of nonreproductive and reproductive gene editing and argues that the statement is inconsistent with the philosophical commitments of some of the authors, who put it forward in relation to reproductive uses of gene editing, specifically their commitment to Parfitian nonidentity considerations and to a legal principle of reproductive liberty.But, if that is true it raises a question about why the statement is made. What is its discursive and rhetorical function' Five functions are suggested, some of which are more contentious and problematic than others. It is argued that it is possible, perhaps even likely, that the “only when it is safe” rider is part of a deliberate obfuscation aimed at hiding the full implications of the arguments made about the ethics of gene editing and their underlying philosophical justifications. Abstract: There is a role for regulatory oversight over new genetic technologies. Research must ensure the rights of human subjects, and all medical products and techniques should be ensured to be safe and effective. In the United States, these forms of regulation are largely the purview of the National Institutes of Health and the Food and Drug Administration. Some have argued, however, that human genetic therapies require new regulatory agencies empowered to enforce cultural norms, protect against hypothetical social harms, or ensure that the human genome remains unchanged. Focusing on the United States, this essay will briefly review these arguments and argue that the current limited regulatory role over human gene therapies is sufficient to protect public health, bodily autonomy, and reproductive freedom. 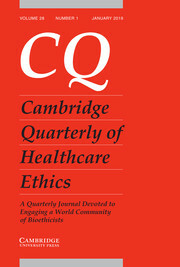 Abstract: In the conduct of clinical trials for pharmaceutical research, access to investigational medicines following clinical trials is often necessary for the continued health and well-being of the trial participants; it is an ethical obligation under some circumstances, as outlined in the Declaration of Helsinki 2013 Article 34. This obligation becomes particularly important in lower-income countries, where access to medical care may be limited. Although there is agreement among global research and bioethics communities that continued access should be provided with prospectively defined parameters and procedures, the process is complex, as many responsible parties and complicated logistics are involved. Roche Pharmaceuticals developed and publicly posted the company’s policy regarding continued access to investigational medicines in 2013. This article provides insights on the policy, including the parameters that determine when continued access is and is not considered to be appropriate, along with an example from an active clinical development program. It also describes how multiple stakeholders, including those in academia, industry, government, and patient advocacy, have worked together to assess approaches to continued access. Continued access plans should be transparent and agreed to by research participants, investigators, and governments prior to the study and reassessed based on clinical trial evidence of safety and efficacy and availability of adequate treatments, along with relevant international laws and customs. Conducting responsible continued access programs requires close partnerships with investigators, health authorities, and third-party research partners. Abstract: Healthy volunteers (HVs) who participate in clinical trials are a vulnerable group that deserves specific protection. We assessed the number and types of studies that involve HVs around the world and outline the methodological barriers to their analysis. We found that tens of thousands of HVs are involved every year in clinical trials in a large variety of countries and that the overwhelming majority of studies are not “first-in-human” but pharmacokinetic studies. The two cornerstones for both ethical and safe participation of HVs in clinical trials are properly obtained informed consent and a minimization of exposure to risk, in particular by avoiding concealed participation in multiple trials. To minimize the risk of exploitation of HVs and their exposure to risk, we propose ways to ensure genuine informed consent, and advocate setting up national healthy volunteer registries as established in France and the U.K.
Abstract: Health research is generally undertaken to resolve existing health problems or enhance existing solutions. Research ethics committees have been the main governance tool for research for more than half a century. Their role is to ensure that research is undertaken ethically. To close the increasing gap between science and society, other governance tools are required. The European Commission recommends and actively promotes the policy of responsible research and innovation (RRI). In addition to sound research ethics, a key feature of RRI is the involvement of different societal stakeholders throughout the research process.But how accepted is the involvement of societal stakeholders in the research of small- and medium-sized enterprises (SMEs) in the health care sector' This question is examined based on 18 in-depth interviews with private health care industry representatives from across Europe in companies focusing on developing medical device technology. Findings suggest that SMEs are reluctant to undertake research involving patients, especially in the early stages of the research and innovation process. For some SMEs this is due to concerns about the dangers of raising expectations they cannot meet, while for others the main concerns are increasing costs and producing less competitive products. Implications of the research findings are discussed. Abstract: Cross-sectorial, dynamic, and innovative partnerships are essential to resolve the challenges of humankind in the 21st century. At the same time, trust in each other’s integrity and good will is a precondition for the solution of any complex problem, and certainly for the success of the United Nations Sustainable Development Agenda. Experience shows that a nation’s economic and social success is at its greatest if, and when, there is cooperation and even cocreation involving a fair division of labor and responsibility among the different societal stakeholders. This paper uses Ralf Dahrendorf’s seminal work on obligations, as well as the European Commission’s Science with and for Society unit’s definition of responsible research and innovation (RRI), to motivate industry responsibilities to make the world a healthier place. Abstract: The available treatments for disorders affecting large segments of the population are often costly, complex, and only marginally effective, and many have numerous side effects. These disorders include dementias, debilitating neurological disorders, the multiple types of drug addiction, and the spectrum of mental health disorders.Preliminary studies have shown that a variety of psychedelic and similar U.S. Drug Enforcement Administration Schedule I drugs may offer better treatment options than those that currently exist and pose potentially the same or even less risk than do legal psychoactive (alcohol, caffeine, nicotine) and nonpsychoactive (aspirin, acetaminophen, ibuprofen) substances. The pharmaceutical industry and academia, however, have largely avoided this avenue of research.Fairness to the affected populations demands that these drugs be adequately studied and, if they or their congeners are shown to be effective, made available with the proper caveats, instructions, and protections that other potentially abused medications (e.g., narcotics) receive. These substances may prove to relieve patients’ struggles with less effective treatments and decrease mortality from nontreatment of some conditions. Abstract: Documentation of code status and advance directives for end-of-life (EOL) care improves care and quality of life, decreases cost of care, and increases the likelihood of an experience desired by the patient and his/her family. However, the use of advance directives and code status remains low and only a few organizations maintain code status in electronic form. Members of the American Medical Informatics Association’s Ethics Committee identified a need for a patient’s EOL care wishes to be documented correctly and communicated easily through the electronic health record (EHR) using a minimum data set for the storage and exchange of code status information. After conducting an environmental scan that produced multiple resources, Ethics Committee members used multiple conference calls and a shared document to arrive at consensus on the proposed minimum data set. Ethics Committee members developed a minimum required data set with links to the HL7 C_CDA Advance Directives Module. Data categories include information on the organization obtaining the code status information, the patient, any supporting documentation, and finally the desired code status information including mandatory, optional, and conditional elements. The “minimum set of attributes” to exchange advance directive / code status data described in this manuscript enables communication of patient wishes across multiple providers and health care settings. The data elements described serve as a starting point for a dialog among informatics professionals, physicians experienced in EOL care, and EHR vendors, with the goal of developing standards for incorporating this functionality into the EHR systems.